Bandana Baby Bibs | Denver Set - 4 Pack | Parker Baby Co. | Parker Baby Co.
Teething babies can drool a lot. Keep your precious baby dry, comfortable and compliment their clothing with Parker Baby’s bandana bibs. The Denver Bandana Bib Set is laid back with a little bit of attitude. These are the only bibs that keep my five month old son’s clothes from getting drenched in drool. It’s a bonus that the patterns are so hip too! I am in love with the bandana bibs I order nearly every color and I'm glad I did. I was worried about the polyester backing but so far no rashes. They are very soft front and back and comfortable to the point of my baby falling asleep and not being annoyed by velcro rubbing his hair and neck. I will be purchasing more soon for gifts. This has been my 3rd time ordering from the Good Baby. 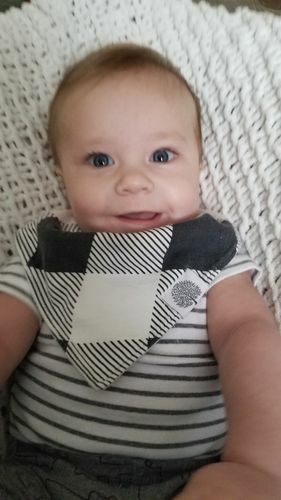 These bandana bibs have been my favorite since day 1. I wanted something stylish/comfortable for my little guy and these bibs hit it spot on! Forever customer!! Absolutely love these bibs! All the bibs by this company are always exceptional. They never fade, they are soft, easy to put on (have two buttons for sizing) and have the cutest designs. We always get compliments on these bibs! This is so incredibly soft on the inside and very durable! I'm in love!